Over the weekend, the A’s swept the Rangers. On its own, that’s hardly remarkable. The A’s are a good team, and they’re playing for something. The Rangers are a worse team, and they’re playing to stop playing. Given the extra distance the A’s put between themselves and the Mariners, this might’ve been the weekend the AL playoff picture was basically decided. Where it gets interesting is when you see how the A’s won the three games. Besides scoring 23 runs, I mean. On Friday, the A’s resorted to using an opener, in the person of Liam Hendriks. He threw a scoreless inning. On Saturday, Edwin Jackson started, and he allowed four runs in three innings. On Sunday, Trevor Cahill started, and he allowed three runs in 2.2 innings. The A’s starters combined for 6.2 frames, with a 9.45 ERA. Many have been skeptical of the A’s for a while, and they’ve pointed to the starters as the reason. The starters, you see, are not great. But all the innings not thrown by starters were thrown by relievers. Over the weekend, no team’s bullpen threw more innings than Oakland’s 20.1. It allowed a wOBA of .250, with a 2.66 ERA. The A’s swept the series, even though the starters weren’t helpful at all. Part of the reason is because they hit. And part of the reason is because of the relief. Relieving has really been the main story here. Even I can’t believe the statistics. The Mariners hardly matter anymore, but for as long as they were leading or close to the lead in the race, there was talk about their success in one-run ballgames. It’s a major reason why the Mariners have so dramatically outplayed their run differential. The Mariners have a league-leading 35 one-run wins. They have about twice as many one-run wins as one-run losses. And yet! And yet, the best one-run-game record belongs to the A’s, at 27-12. It would stand as one of the better such records in recorded baseball history. What the Mariners have done, the A’s have done too, and they’ve done it so far without collapsing. One thing we know about success in one-run games is that it’s damn noisy. But another thing we know is that, at least in hindsight, it can be closely related to bullpen success. The more effective the back of the bullpen, the less likely it is a reliever screws up with the game on the line. I’m going to start drowning you now with information. We’ll ease into it. Here’s a plot showing all 30 teams. 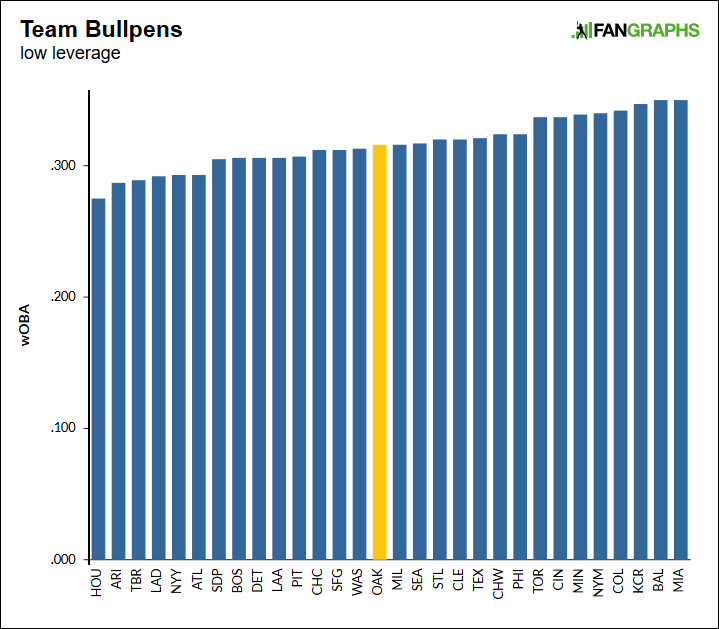 You’re seeing each team’s bullpen wOBA allowed, in low-leverage situations. It’s the A’s, out all by themselves. No one is even especially close. 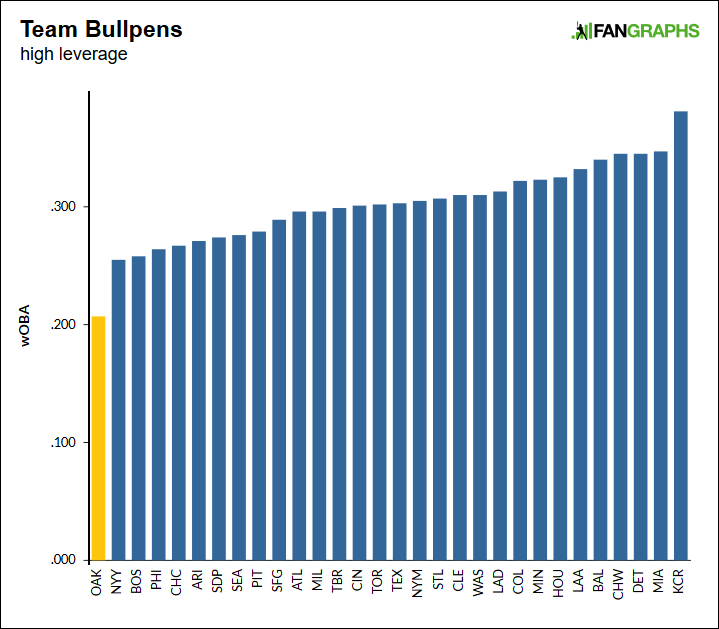 In fairness, it only makes sense that some of this is luck — for example, in high-leverage situations, the A’s bullpen has given up fewer hits than you’d expect. But the take-home message here is that, as the situations have gotten tougher and tougher, the A’s bullpen has pitched better and better. That’s exactly what you want from a bullpen. Blake Treinen is easily the biggest individual factor here. Just over 50% of his batters faced have come in high-leverage spots, and that’s a rate that leads both leagues. The A’s have gotten the ball to their bullpen stopper. But this is always about more than one guy. Treinen alone isn’t responsible for Oakland’s win probability added. Here’s a win-probability-added refresher. It’s not a great predictive tool, but it’s useful as a way to divvy up credit. I like to use WPA to see which bullpens have and haven’t been pulling their weight. Behold the 2018 landscape of team relief pitching. Once again, I’ve highlighted Oakland in yellow. Would you look at that? The A’s have the second-highest bullpen WPA on record. They’re very close to first, and they should have little trouble getting there over the remainder of the season. 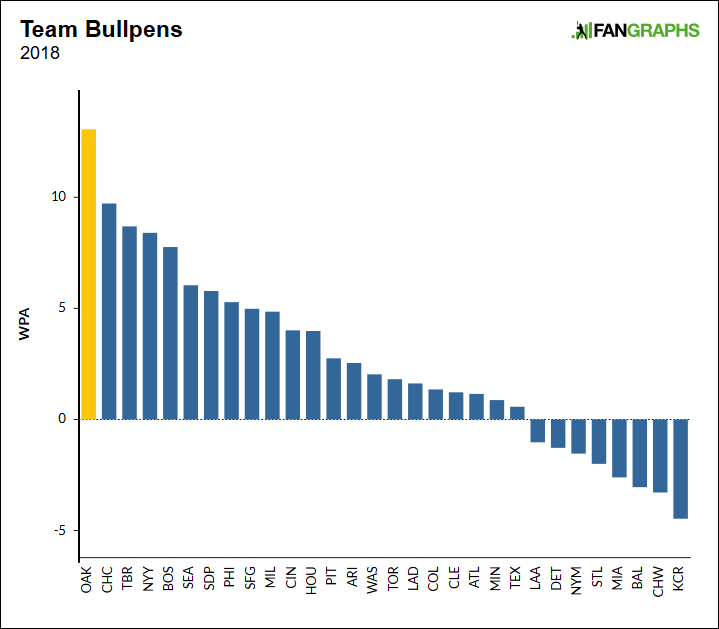 In recent memory, we haven’t seen a team bullpen as valuable and effective as this one. Not in the regular season. And it gets even crazier, because while the 2018 A’s rank first in bullpen WPA, the 2017 A’s ranked…last. 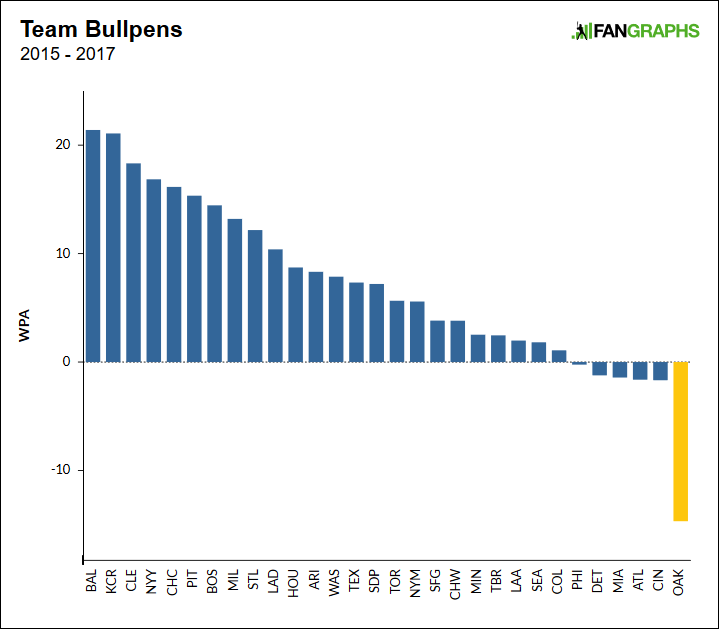 Between 2015 – 2017, the Oakland bullpen was 13 wins less valuable than the next-worst bullpen in either league. And in 2018, again, the A’s rank first, more than three wins ahead of second. What’s the precedent for such a year-to-year turnaround? It might not surprise you to learn the A’s rank first again. From last year to this year, the A’s are on track for about a 20-win improvement from the bullpen. The biggest improvement we’ve seen before was achieved by the 2008 Rays, whose bullpen got better by about 18 wins. And then there are the 2017 Rockies, whose bullpen got better by about 15 wins. Now, the Rays’ bullpen went from 30th in baseball, to first, to 24th. The Rockies have gone from 30th, to third, to 18th. I can’t promise the A’s much in the way of year-to-year stability. Things happen; great bullpens get worse. But what’s most important for right now is what the A’s have already pulled off. They’re going to make the playoffs. It would take a collapse of historic proportions for that not to be true. Credit goes around to the entire roster, and, yes, some of it goes to the starting rotation, but nothing has been more important to the A’s than their bullpen. Treinen and company have slammed the door shut when the stakes have been at their highest, and that’s why the Astros still don’t have the division locked up. Oakland has given the most important at-bats to the best pitchers on the team, and by and large they’ve done their job. It looks like this will be the most valuable team bullpen in decades. It looks like this will be the most dramatic team bullpen turnaround in decades, as well. The importance of a great bullpen can be frustrating, because building a reliably great bullpen is almost impossible. Relievers just don’t work that way. But when it all suddenly comes together, it can be a beautiful thing. For three consecutive years, the A’s bullpen suffered. For more than five consecutive months, the A’s bullpen has been amazing. I don’t know how long the team will last in October, but it’s already got the October pitching staff figured out. We hoped you liked reading The Oakland Bullpen Has Been a Borderline Miracle by Jeff Sullivan! They will have 22 pitchers on the active roster by Thursday when Montas and Anderson return. That’s a large pen.